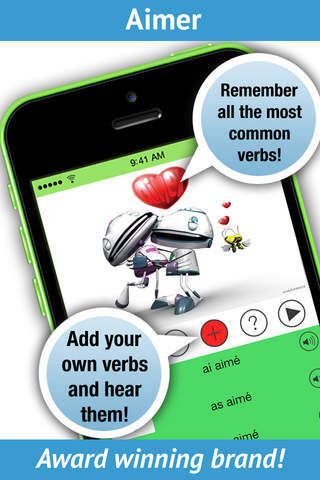 Welcome to 'French Verbs Pro' the FULL version of our award winning LearnBots App. 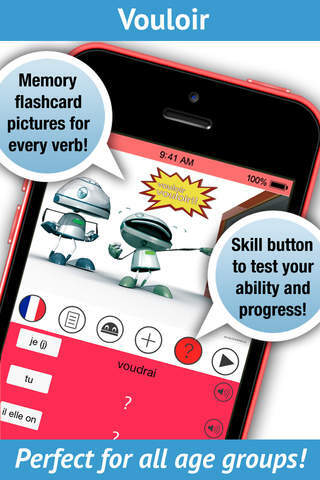 This App is the perfect 'Kick-Starter' for you to learn all those difficult French verbs and important conjugations. 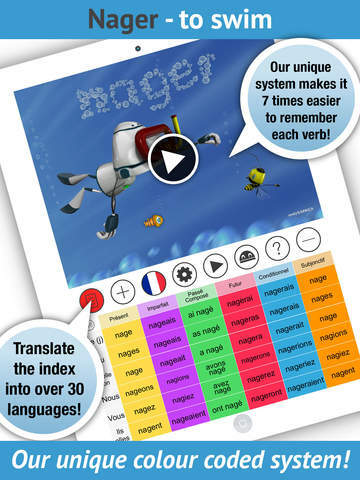 With it's highly stimulating and 'Multi Award Winning' memory system' it will show you how to learn French verbs and their key conjugations 7 times faster than any other traditional method. Also with it's full pronunciation from a native speaker and the ability for you to add thousands of extra verbs and conjugations this App is perfectly suited for students at all levels!! LearnBots is a UNIVERSAL app that includes both the iPhone and iPad versions. Most apps make you pay twice but with LearnBots, you get two for the price of one! * Worlds easiest way to practice and remember your verbs! * Remember your verbs 7 times faster than 'Any' other method! * Pronunciation by a native speaker! * Add your own verbs and even hear them! * Create your own favourites list! * Animations for each verb! * Write and then check your conjugation spelling! * Colour memory pictures for each verb! * Native index translation in over 30 languages! * Skill button to test ability! * Most commonly used verbs! * Perfect for all age groups! * For beginners to advanced! * Very easy to use! * Compatible with your iPhone & iPad!